A University of Ulster PhD student has won a prestigious funding award to travel to New York next month and explore how digital technologies and projects in America could be used to enhance the experience of visitors to Northern Ireland museums and art galleries. The research project will see Oonagh Murphy, from Belfast, spend five weeks in the Big Apple exploring how four of the world’s top museums have used social media and online content to promote art history education and engage and encourage new audiences in this increasingly digital age. Her trip will enable her to identify transferable practices that could be applied by museums and art galleries in Northern Ireland. Oonagh, who is studying with the University’s Arts and Humanities Research Institute (AHRI) at the Magee campus, applied for a Winston Churchill Memorial Trust Fellowship award after hearing about the opportunity via Twitter. The talented student then underwent a rigorous application process and submitted a project proposal focusing on four New York museums that are recognised as international leaders in the development of digital museum practice – Brooklyn Museum; the Museum of Modern Art (MoMA); the Guggenheim and the Met. Says Oonagh: “When I come back I intend to hold a seminar for museums and galleries to share my findings. I will also continue to develop research and development projects for and with museums in Northern Ireland during the course of my PhD research. Oonagh, who holds a degree in Arts Management from De Montfort University Leicester has worked at the Frieze Art fair for a number of years, and spent a summer working at the Venice Biennale. She says: “The Trust places a focus on research that is embedded within professional practice, and research that will have a direct impact on your local community. 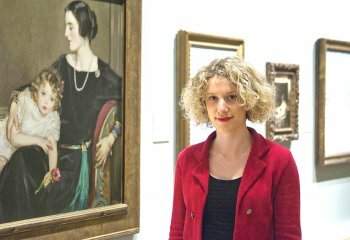 “As my research is about opening up museums, and making them more exciting, engaging and appealing to a broader range of people, I felt that it sounded like a perfect fit for the Winston Churchill Memorial Trust Fellowship. “I’m really looking forward to visiting some of the most exciting and dynamic museums in the world and getting to see their collections and meet the staff that are using digital technologies to create ground breaking ways to engage with visitors and extend the museum experience beyond the walls of museums and galleries. Dr Stanley Black, Head of the Faculty’s Research Graduate School said: “The Faculty is delighted at the news of Oonagh's award. “Her research is developing in a very exciting direction and this opportunity to visit museums and galleries in New York will give it a tremendous boost. The Winston Churchill Memorial Trust was established when Sir Winston Churchill died in 1965. The Trust awards Travelling Fellowships to Britishcitizens from all walks of life to travel overseas, to bring back knowledge and best practice for the benefit of others in their UK professions and communities. Fellows receivea travel grant tocover return and internal travelling, daily living and insurance within the countries visited. Fellowships are awarded for a period of between between fourtoeight weeks. The Trust’s objective for the Travelling Fellowships is to provide opportunities for British citizens to go abroad on a worthwhile enterprise of their own choosing, with the aim of enriching their lives by their wider experience – through the knowledge, understanding, and/or skills they gain – and, on their return, enhancing the life of their community by their example and the dissemination of the benefit of their travels. These opportunities are provided to people of any age, gender, ethnicity or religion, with or without educational qualifications, and in any occupation or none. Each year approximately 100 British citizens are awarded Fellowships for a wide range of projects. Past award winners include nurses, artists, scientists, engineers, farmers, conservationists, carers, craft workers, artisans, members of the emergency services, sportsmen and women and young people. Since 1966, some 4450 Fellowships have been awarded.